Impeccable design, craftsmanship, and architectural variety are just a few reasons why Brunswick Forest continues to be the Coastal South’s fastest growing community. Whatever your architectural style, Brunswick Forest is sure to have something that catches your eye! The bright and sunny Villamar neighborhood in Brunswick Forest transports you into a Floridian state of mind. Each of the Florida-style homes that round out this coveted neighborhood offer homeowners single-level living combined with open and spacious floor plans that welcome in the beautiful Carolina sun. These all brick, red-roofed patio homes encourage outdoor living with spacious lanais, outdoor kitchens, and outdoor lounge areas. Low maintenance living is epitomized in Villamar and allows homeowners to enjoy all of fun-in-the-sun the amenities that are just footsteps away. Feel right at home instantly when you enter the Shelmore neighborhood. This charming Neo-Traditional style neighborhood features white picket fences, large front porches and stunning architectural details that add appeal to each of these unique bungalow style homes. Thoughtful features like built-in benches and welcoming floor plans give homeowners even more reasons to love these coastal Carolina bungalows. Shelmore residents not only enjoy timeless architecture, but they also enjoy the picturesque Hammock Lake Park, a first-class amenity just steps from their homes. Hammock Lake Park offers the perfect place to take a stroll or catch an evening sunset. 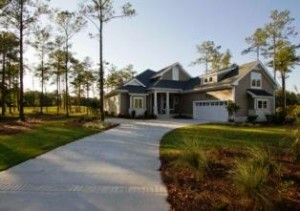 Elegance and exclusivity are paired nicely in the Cape Fear National neighborhood of Brunswick Forest. Rolling golf course views and custom home designs make this elite neighborhood highly sought after. The architectural style of this neighborhood is as individual as the homeowners themselves. Home sites in Cape Fear National are larger in scale offering homeowners in this luxurious neighborhood have the ability to create the custom home of their dreams. Expansive floor plans, grand master suites, and gorgeous green views set these premier golf site homes apart. 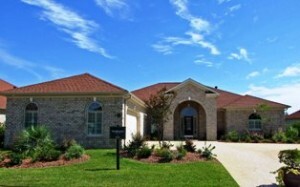 The homes in Cape Fear National captivate the eye, impress, and are desired by many.